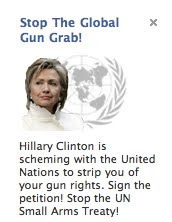 Here is another in what is becoming a series of ridiculous ads on Facebook. Remember back in the 1990s, when there were paranoid right-wingers and militia fanatics claiming that Bill Clinton would soon be taking away everybody's guns, and that there were looming black helicopters and coded government messages on the backs of street signs to help bring about this eventual infringement of our liberties? I guess with the delusional fringe, some things just don't change. For more Facebook freakiness, see past entries for Pigman, Man-Child, and Osama Insurance. Yes, I remember those paranoid right wingers in the 1990s. They killed 168 men, women and children in Oklahoma City.